EVO Amp'd is a Bluetooth speaker and power source that turns your Echo Dot into a portable connected device. Pros: Price, makes Echo Dot portable, long lasting rechargeable battery, simple installation, easy to pair with Alexa app. In today's smart home, one device consumers are drawn to is the Amazon Echo, a solid AI digital assistant. Its design and ability to simplify the way you use your connected devices has been a big hit with customers. However, the price of Amazon Echo is a little steep for some ($179.99 on Amazon) — one reason Amazon launched a smaller, less expensive version: the Echo Dot. This powerful digital assistant has all the features you will find in Amazon Echo, minus the large speaker at a third of the cost. In our review of the Echo Dot, we mentioned how you can connect the device to a Bluetooth speaker, upping the quality of music and sound from the tinier gadget. In fact, when you add in the cost of the Bluetooth speaker (about $100) to the cost of Amazon Echo Dot, it's still less expensive than the original Amazon Echo. What's a good speaker to buy? We decided to try Fremo's EVO Amp'd, which the company sent us to review: a combo Bluetooth speaker and portable power supply. 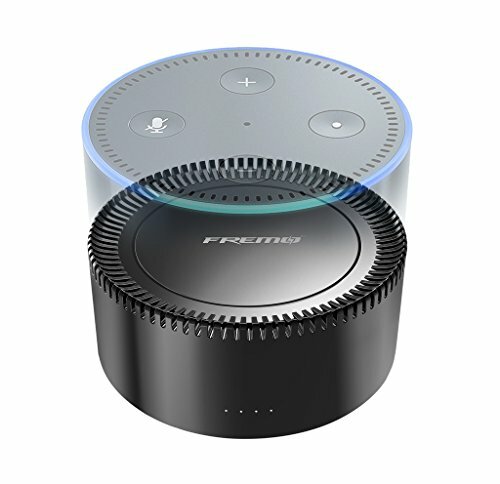 Fremo's EVO Amp'd, is designed specifically for the Amazon's 2nd Generation Echo Dot, turning the Amazon device into a portable digital assistant. The device weighs 116 grams (0.25 lbs. 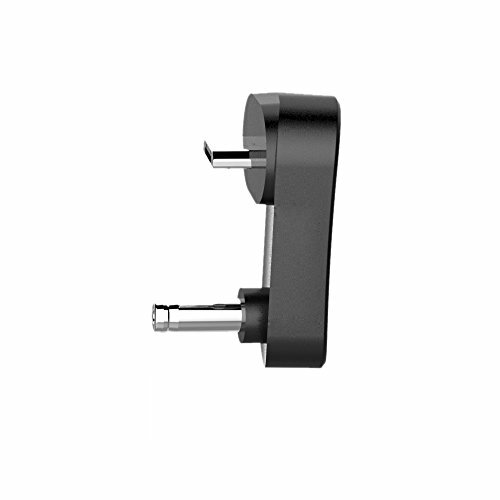 ), stands 35.3mm (1.39 inches) and has a diameter of 83.3mm (3.28 inches). EVO has a 5V 2A input and 5V 1.8A output. You also get a rechargeable battery with a shelf life of one year and is built right on top of a Bluetooth speaker. The one year shelf life means you can leave your EVO uncharged for up to a year and it will still work — even if you after recharging the unit. That's nice to know since many rechargeable batteries seem to die because of overcharging. The EVO battery can last 6 to 8 hours with continuous music playing on one charge. We got a little short of 8 hours in our tests. To set up EVO, pull the blue tab on the metal plate on top of the device. This metal plate is critical to connecting your EVO with the Echo Dot because it secures both devices together, with adhesive on one side of the metal plate. Remove the adhesive covering and place the sticky side of the metal plate on the bottom of your Echo Dot. Then place your Echo Dot on top of the EVO which should connect magnetically. Next, line up the outputs on your Echo Dot with EVO. Insert the EVO micro USB to barrel connector into the appropriate inputs on both your EVO and Echo Dot. 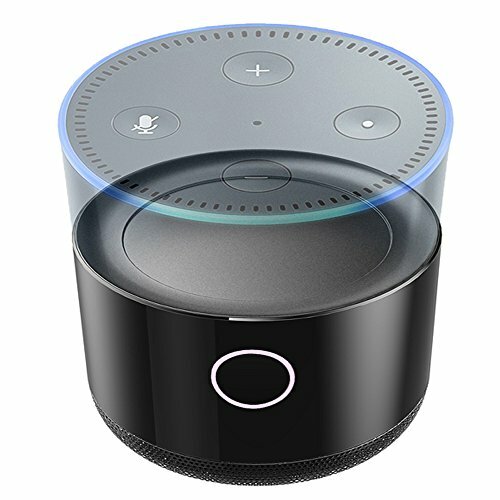 Now you are ready to pair your Echo Dot with the EVO Bluetooth speaker using the Alexa app. We found this part easy as long as you press the button on the front of your EVO at the right amount of time. Press the button for three seconds to turn on your EVO (the LED indicator will light up) and just one second to put the unit into pairing mode. If the lights are spinning, this means the device is searching for another device. If you see the LED indicator solid but less than a circle, this means your EVO is not fully powered. Our advice is to make sure your EVO is fully charged before using. Once power was on, we went into the Alexa app, chose 'Settings' and then clicked on our Echo Dot. We then clicked on the Bluetooth settings and clicked on "Pair a new device." The app will search for your EVO Amp'd. Once found, you will click on the image and Alexa will announce you are connected to EVO Amp'd — and you're done. You don't have to go back and do this step every time you want to use EVO with your Echo Do) Just say to Alexa "Connect my speaker" and Alexa will pair your EVO. Some Bluetooth speakers require you to connect your Bluetooth speaker to your phone each time and then go to Alexa app and connect the speaker with Alexa. Fremo EVO Amp'd USB to barrel connection. We found the sound quality through Evo to be quite good. We would have like to control sound's tone of the sound — which many Bluetooth speakers offer today — but we found no issues with the volume EVO provided. This little speaker can get loud. You control the volume through the Alexa app using your voice or the buttons on top of your Echo Dot. We were, however, a little surprised there was no app for EVO — everything went through Alexa app. Also, we would have liked to see more in-depth instructions (or FAQs) and volume/sound controls in the app. EVO Amp'd Bluetooth speaker just recently came to market this past May and retails for $49. You can buy it on Amazon and E-Bay. In testing EVO Amp'd against other Bluetooth speakers, we found EVO's setup process to be one of the easiest to do. We also liked how once you paired your EVO with Alexa, reconnecting was a great experience. We did have a few issues connecting our EVO to our Echo Dot. It seems our micro USB to barrel connector was faulty. We contacted company and they sent us a new one which worked perfectly, which we recommend if you have a similar experience. EVO pays for repairs or replacement parts, including labor, for 12 months for US-based purchases. EVO is a nice portable and affordable Bluetooth speaker. It does a nice job in turning your Echo Dot into a portable connected device. You do need your Echo Dot connected to Wi-Fi: We tried to use EVO with an Echo Dot through our iPhone 6S which was set up as a mobile hotspot. It didn't work. But when we use EVO with the Echo Dot through our home Wi-Fi connection in our yard, everything went very well. Even with a low signal, EVO still worked. This little Bluetooth speaker can also link up with other connected devices besides Echo Dot. Connect EVO using your smartphone or tablet Bluetooth connection. The only change we'd like would be to be able to control the sound and volume via an app. When connected to your Amazon Echo Dot, using voice to control the volume is nice. But, we would like to adjust the sound quality. Overall, EVO does a great job of turning your Echo Dot into a portable connected device with ease. It offers a very good battery life for a Bluetooth speaker and can be purchased at an affordable price. The design is sleek and sturdy, but the unit is only available in black today: A white version for white-colored Echo Dot owners would be nice from an aesthetic viewpoint. We also hope the company will consider offering a carrying case as well as an app to control sound quality and volume. Then, we think you'd have all the bases covered for an effective Bluetooth speaker with Alexa as your host.